1. Combine 1/2 cup salsa, chili powder and 1 teaspoon cumin. Place beef steaks and marinade in food-safe plastic bag; turn to coat. Close bag securely and marinate in refrigerator 6 hours or as long as overnight, turning occasionally. 2. Combine 1 cup beans, remaining 1/2 cup salsa and 1/2 teaspoon cumin in medium microwave-safe bowl. Mash with fork into chunky paste. Cover and microwave on HIGH 1 to 2 minutes or until hot, stirring once. Keep warm. 3. Meanwhile, heat 1-1/2 teaspoons oil in large nonstick skillet over medium-high heat until hot. Remove steaks from marinade; discard marinade. Cooking in batches, place steaks in skillet (do not overcrowd) and cook 2 to 3 minutes for medium rare (145 degrees F) doneness, turning once. (Do not overcook.) Remove steaks from skillet; keep warm. Repeat with remaining steaks and oil. 4. Spread bean mixture evenly on tortillas. 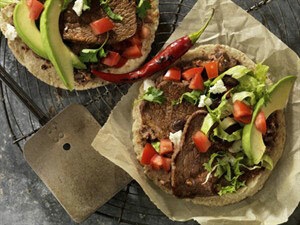 Cut steaks into 4 pieces each and divide evenly among tortillas. Top beef with remaining beans and Toppings, as desired. Fold tortillas in half to serve.